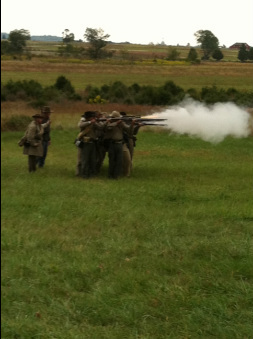 The mission of the PRINCESS ANNE GREY’S (LEE’S SHARPSHOOTER’S) Living History Association is to promote a better understanding of the life and times surrounding that period of our nation’s history known as THE WAR FOR SOUTHERN INDEPENDENCE. We, as the members of this unit, and our sister units of the Independent Volunteer Rifles (IVR) strive to educate the public by portraying as accurately as possible the living conditions, camaraderie and fighting techniques of the soldiers of the original Princess Anne Grey’s (PAG) during the years 1861 to 1865, and Lee’s Sharpshooter’s during the period of April 1863 to April 1865. We do this in the belief that such knowledge will bring to the people of the United States of America a greater understanding, kinship and respect in the southern citizen soldier and of the history of this great nation.Our regular infantry impression of the Princess Anne Greys strives to represent the typical Confederate soldier from the Virginia Tidewater region during the war. The original Princess Anne Greys, Co. B of the 6th VA Infantry, were engaged in some of the heaviest fighting of the war and served with distinction in Mahone's VA Brigade. Many of the men from the PAG were levied against the Sharpshooter Battalion for Mahone formed in late 1863. We are actively seeking individuals in the mid-Atlantic region (VA, NC, MD) with determination to "do it right" and represent the common Confederate soldier with all the respect he deserves. Centrally located in the Tidewater area of Virginia, we are a "campaign" oriented unit who lives by what we carry on our backs and research all that we wear and do on the field. 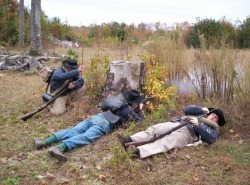 If you are looking for something new in the Civil War hobby, love scouting and skirmishing along with the traditional role of line infantry, and relish opportunities to camp on actual battlefields, work with the NPS, and educating the public...you've come to the right place. We have two impressions that we portray, The Princess Anne Greys and that of Sharpshooter in the Army of Norther Virginia. The goal of the Princess Anne Greys (Lee’s Sharpshooters) is to field a historically accurate Army of Northern Virginia company, with soldiers striving for the most accurate impression, appropriate to the unit and time period in question. In general terms, the primary impression shall be a Army of Northern Virginia impression suitable for the time period of late 1862 through early 1864. This accuracy will extend to both the appearance and conduct of the company. The PAG(LS) will provide to both its members and the public, when present, an impression of an ANV unit consistent with the best available documented historical research and sources of authentic uniforms, accoutrements, weapons, and other equipment. Limitations of historical accuracy in the company impression will be confined in general to those imposed by concerns for the health and safety of our members. 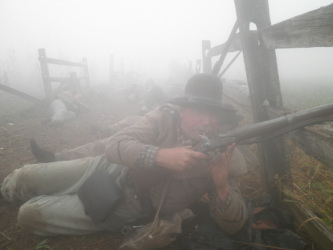 The Confederate Sharpshooter impression is our most complex in that we do not represent any one particular unit, but strive to be able to represent any of the predominate sharpshooter battalions of the Army of Northern Virginia during the period of 1863 to 1865. In this way , we can represent various sharpshooter units based on location and the scenario we portray. Click HERE for a History on these two impressions.